Britain has launched the worlds most advanced nuclear submarine. 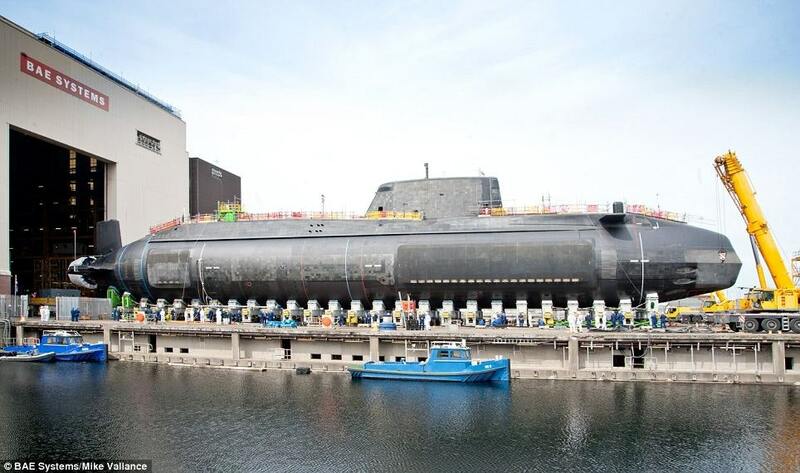 HMS Artful, a 7,400-tonne Astute class attack submarine, was moved out of its construction hall at Barrow-in-Furness, Cumbria, on Friday and was lowered into the water the following day. “The launch of Artful is another significant step forward in the Astute programme. Building on past experiences we’ve been able to launch her in the most advanced state of construction of any submarine to be built in Barrow. 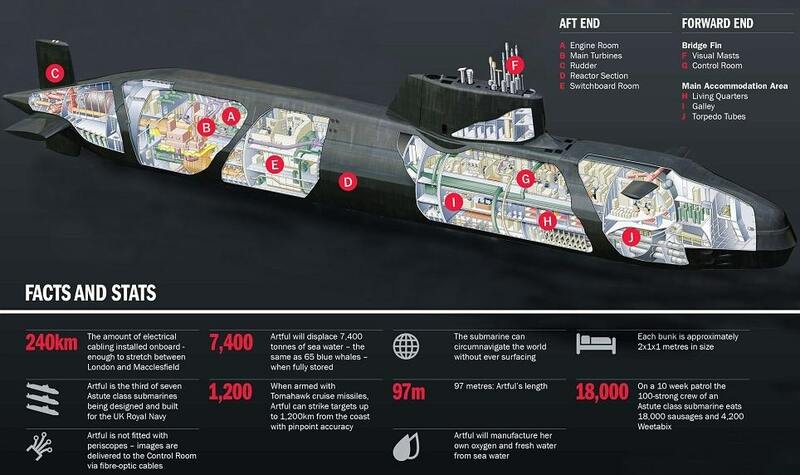 Artful is the third of seven Astute-class nuclear submarines being built for the Royal Navy and is now expected to begin the next part of its test and commissioning process ahead of sea trials next year. It will also undergo a series of tests to prove the safety and operability of its systems before it departs for sea trials. Artful was officially named in front of thousands of guests in September last year at an event to mark the end of its build process. However, earlier last year it was reported that the nuclear safety watchdog had blocked the launch of the Royal Navy’s newest reactor-driven submarine because of a risk that a dockside could collapse. The Office for Nuclear Regulation had blocked the launch of Artful because of doubts about the integrity of the wet dock quay at Barrow-in-Furness, Cumbria. The submarine’s manufacturer, BAE Systems, had previously planned for a launch this year but now says it will be early next year. It said the problem with the dock will not cause further delays. The Astute class of vessels, while nuclear powered but not nuclear armed, have impressive conventional firepower, advanced communications equipment and advanced stealth technology. The submarine has stowage for 38 weapons and will typically carry both Spearfish heavy torpedoes and Tomahawk Block IV cruise missiles. The Tomahawk missiles are capable of hitting a target to within a few metres within a range of 1,240 miles (2,000 km). Artful’s nuclear reactor will not need to be refuelled during the boat’s 25 year service. Since the submarine can replenish her air supply and purify water underway and while submerged, she will be able to circumnavigate the planet without resurfacing. The submarine’s main limitation will be from the three months supply of food carried for the 98 officers and ratings. The first two submarines in the Astute class, HMS Astute and HMS Ambush, have now been handed over to the UK Royal Navy, while the remaining five are still in build. How is it we can build nuclear reactors on submarines yet we have to ask other countries to build our nuclear power stations?